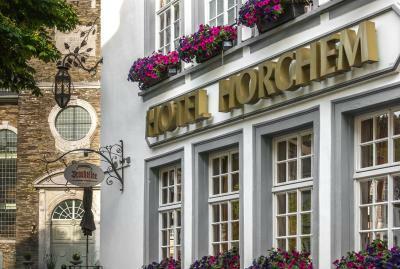 Lock in a great price for Horchem Hotel-Restaurant-Café-Bar – rated 8.5 by recent guests! 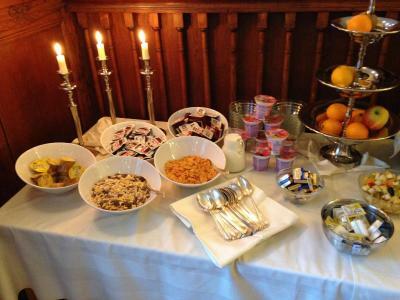 Breakfast excellent with plenty of choice incl. 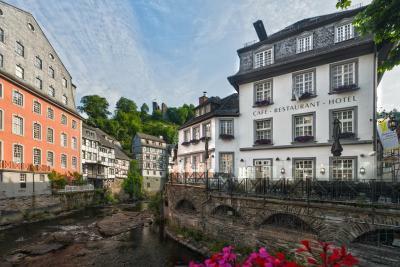 nice charcuterie and cheeses, as well as fruits of the season; Great location in the heart of this most amazing small medieval town, right next to the bubbling Ruhr river. Very helpful and friendly staff. Exemplary !! 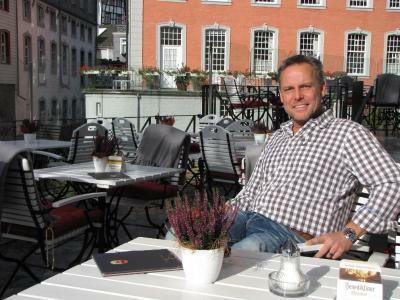 The owners and staff were great and the hotel location is the best and the restaurant was fantastic. 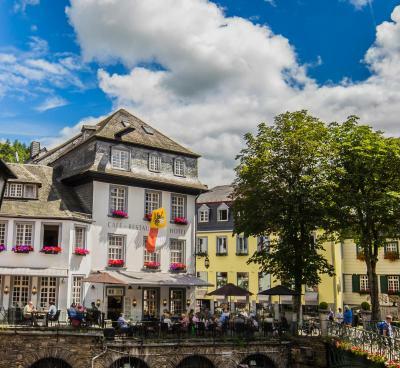 WE LOVE MONSCHAU AND TRY TO VISIT THIS LITTLE OLD TOWN EVERY YEAR ! Friendly staff, breakfast buffet was small but okay. The view through the tiny windows were very nice, and the bathroom seemed to have been renovated recently. It was very bright and clean. Best Location!! The room and other facilities were absolutely excellent, and the staff was super nice. The surroundings were lovely too - all in all a place I'd like to return to! 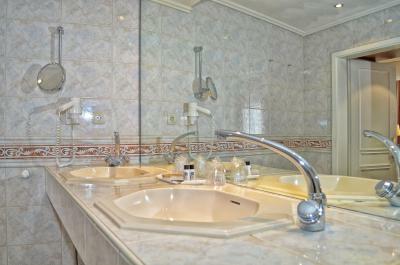 Very nice location (very close to restaurants, shops, bakeries). Breakfast. Big bathroom. 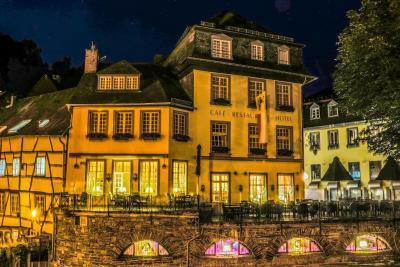 We loved the location right in the town square, beautiful little town and hotel is in the perfect place. The hotel itself was beautiful and staff was very friendly. The rooms were perfect for families, we got a 3 bedroom apartment and was very spacious and super clean and tidy! Bathrooms were immaculate and had a soaking tub for when the littles want to take a bath. I would definitely stay here again in the future! 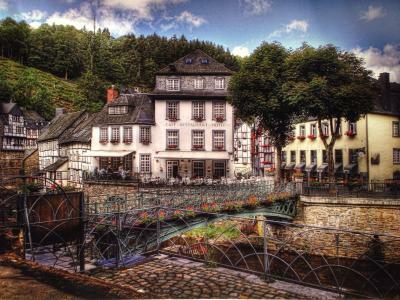 There are many activities to do in the town like hiking and biking and is very close to the Eifel national park. The hotel will even pack you a lunch for the next day as long as you let them know the day before! 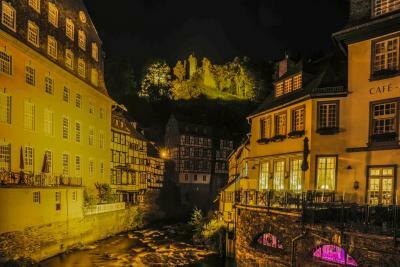 Best stay ever in the most relaxing little town! The beds were like clouds! 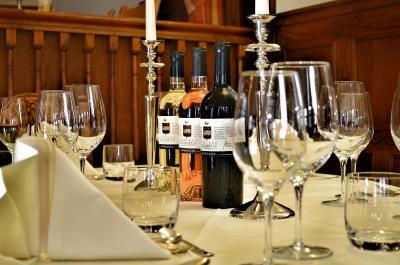 The staff were all exceptionally friendly and accommodating. I would definitely recommend staying here! 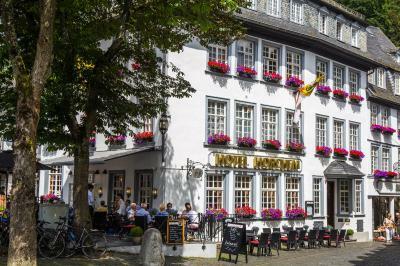 Horchem Hotel-Restaurant-Café-Bar This rating is a reflection of how the property compares to the industry standard when it comes to price, facilities and services available. It's based on a self-evaluation by the property. Use this rating to help choose your stay! 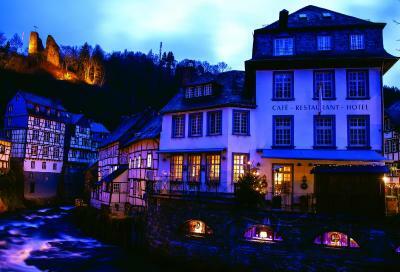 One of our top picks in Monschau.Offering a restaurant, the 3-star superior Horchem Hotel-Restaurant-Café-Bar is located in Monschau. Free Wi-Fi access is available. Each room here will provide you with a TV and satellite channels. 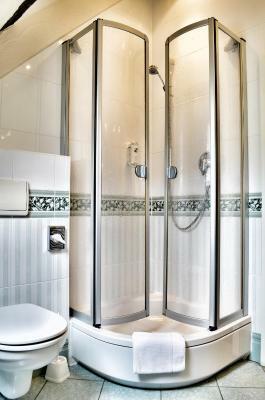 Featuring a bath or shower, private bathroom also comes with a hairdryer and free toiletries. 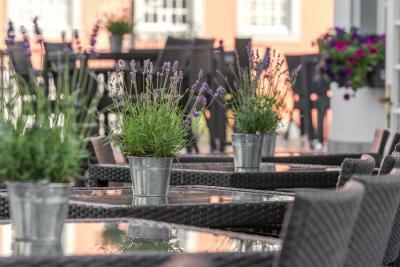 At Horchem Hotel-Restaurant-Café-Bar you will find a terrace and a bar. Other facilities offered at the property include meeting facilities, a ticket service and luggage storage. An array of activities can be enjoyed on site or in the surroundings, including cycling and hiking. 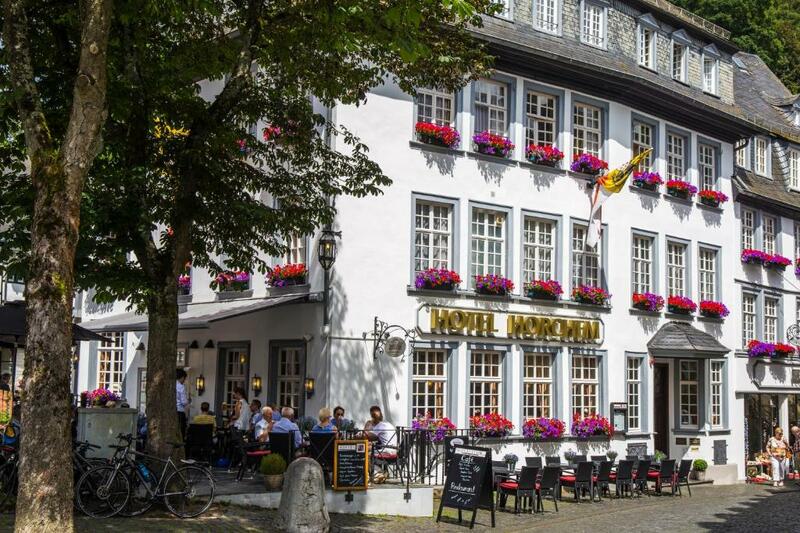 When would you like to stay at Horchem Hotel-Restaurant-Café-Bar? 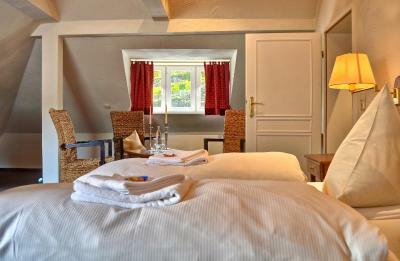 Classically furnished room with satellite TV, a telephone, a luggage rack and a private bathroom with a bath or shower, a hairdryer and a cosmetic mirror. This room offers extra space and a lovely view of the Red House (church). 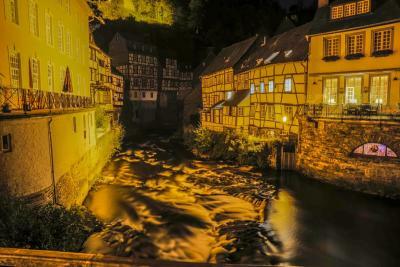 The River Rur flows directly alongside the room. This room features 2 single beds, positioned successively, not next to each other. One is 35 in wide, while the other one is narrower at 31 in in width. This suite features 2 separate bedrooms, each with a double bed and a sofa bed. 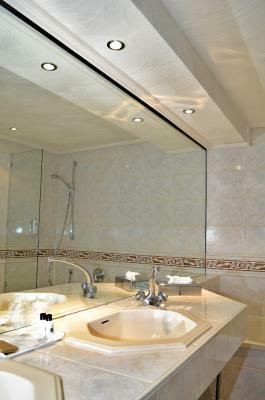 The bathroom is located within the first bedroom. The sofa-bed can each sleep 2 children or 2 adults. This apartment features 3 separate rooms with double beds and a private bathroom. In addition, this apartment also features a small separate living room. This large apartment offers space for a family of up to 6 people. It consists of 3 separate bedrooms, a living area and a bathroom. It is located in the annex and is accessed via the back yard. 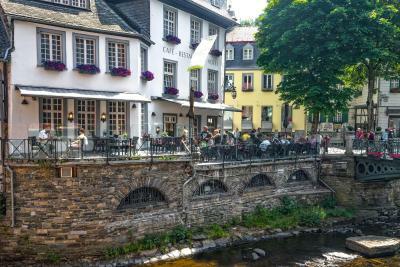 The apartment looks out towards the Ruhstraße and the Rur Bridge, which are popular with visitors in summer, and there is a lovely view towards Rahmenberg. This small apartment is in the annex and is accessed via the back yard. 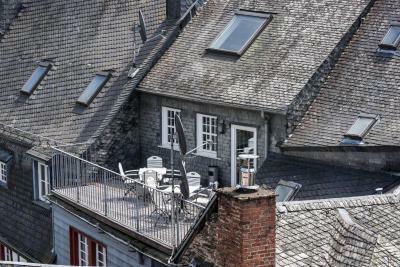 The cozy apartment includes an extra sofa bed, a small balcony with a direct view of the Red House (church) and the River Rur which flows alongside. 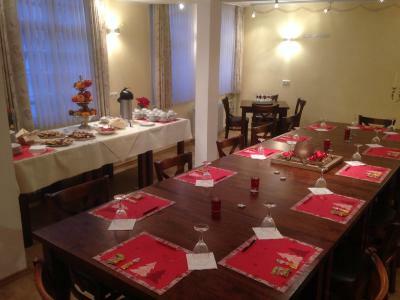 If guests staying in this apartment book meals, the meals are served in the main building. 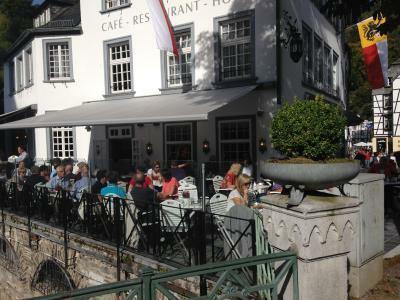 House Rules Horchem Hotel-Restaurant-Café-Bar takes special requests – add in the next step! 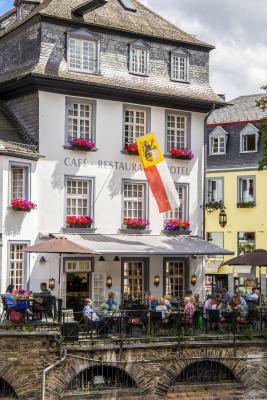 Horchem Hotel-Restaurant-Café-Bar accepts these cards and reserves the right to temporarily hold an amount prior to arrival. In the light of the old age of the building, it would perhaps be very difficult to install an elevator. Now several steps need to be mounted to reach the upper rooms on the 2nd floor, although not insurmountable. 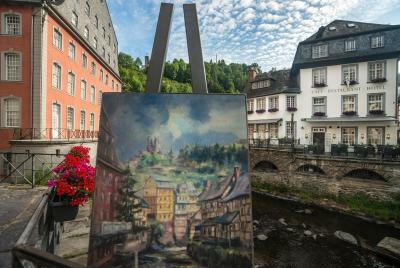 Superb location in the heart of Monschau. 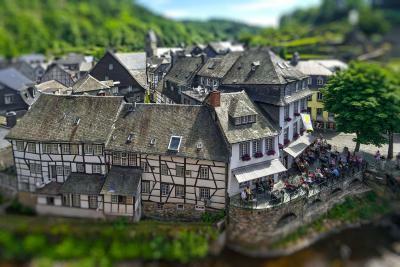 Very beautiful view from our bedroom and from the nice terrace by the river. Very good service, the personnel was friendly and keen to help us. Plenty of nice food for breakfast in the nicely decorated restaurant was the icing on the cake. One bed was a little bit smaller than the other, i believe 80 cm wide. But was still ok, they also mentioned it in the room description. We were denied dinner at the hotel on Monday evening around 7:15 - 7:30. This was very disappointing as we had my 83 year old mother with us that ended up not having any dinner that night since she had limit ability to walk anywhere else. 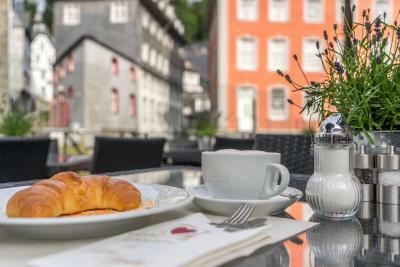 Great location, friendly staff, and great breakfast as well. The hotel was very dog friendly so I recommend staying here if you are traveling with your pet like I did. Bad pillows, as usual in Germany Noisy rooms, certainly these at the stairs. Kettle and fridge would be nice. 3 bedrooms. Clean. Comfortable beds. We loved everything about this place. 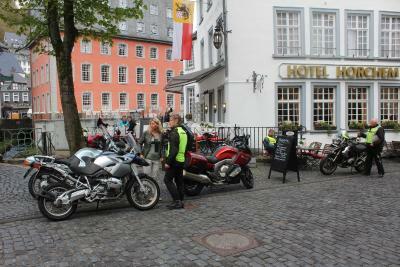 It was noisy due to bar in basement and smokers outside in courtyard- likely only on weekends. They supply earplugs which is thoughtful. 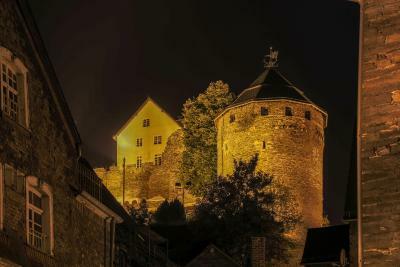 Great location in center of town. Beds and pillows needs replacement. Beautiful traditional building. Excellent location. Attentive staff. Breakfast was good.